Yesterday, I was ready to dive in to lunch. I made it Sunday and since curry always tastes better the next day, I didn’t eat a full serving. 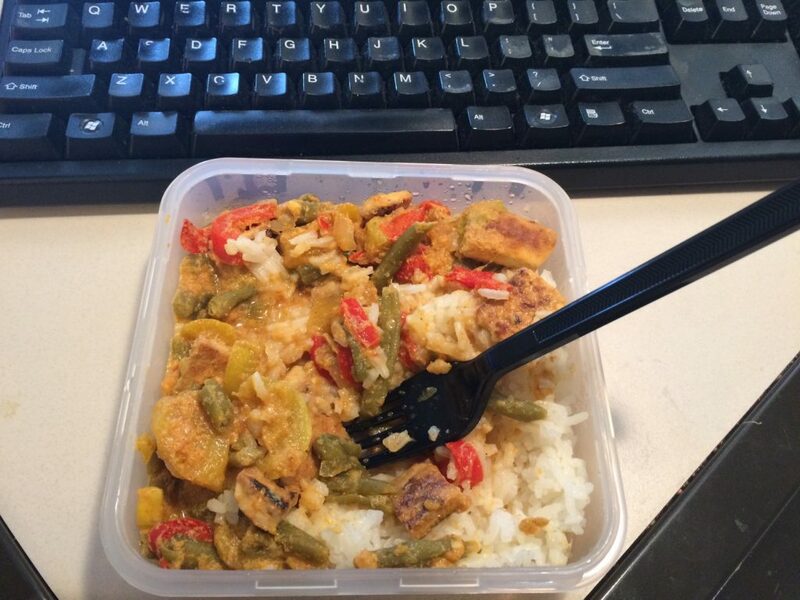 Instead, I tasted to make sure it was seasoned well and then packed up six lunch-sized containers. I stacked them in the fridge with high hopes for a tasty experience throughout the week. Give me a good recipe and I can cook anything. I’m not a culinary expert. I am an expert direction follower. And I had followed the directions. Before I go further, I should mention that I’m vegan. See previous post as to why, here. Thus, there is tofu in this recipe. 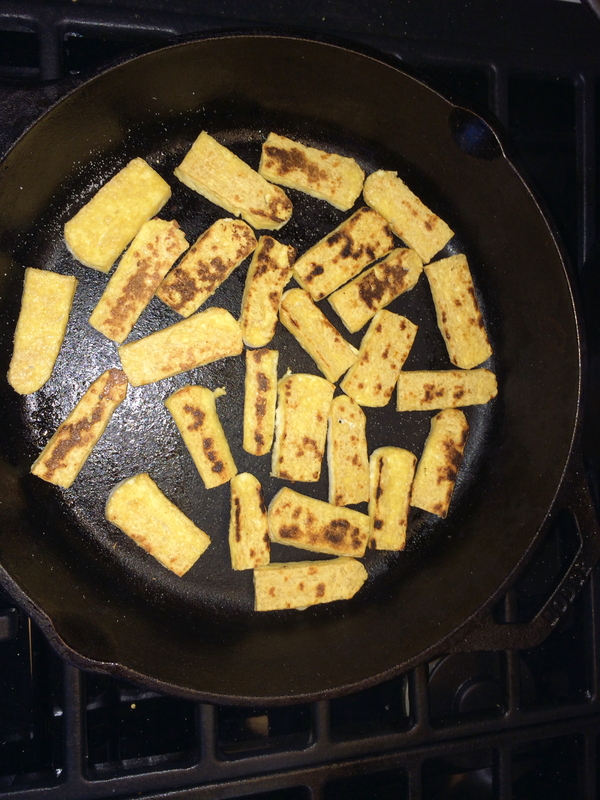 Also, this was my third attempt at cooking tofu. My first two attempts were, in short, epic failures. Attempt #1, I made Tofu Chili (recipe here). I drained the extra firm tofu on paper towels, crumbled it up, and sautéed as instructed. Cooked it in the chili for an hour. Chili tasted great once I picked all the tofu out. Attempt #2, I made Tofu and Potato Hash Browns (recipe here). Again, I drained and blotted the tofu, cut it up, and sautéed it with the potatoes. Ended up eating the potatoes and leaving the tofu behind. Far, far behind. Need to sear something? Cast iron is my tool of choice. Got one. Pressed the tofu. Which was kinda fun. Sliced it. Then I was instructed to sear it. Used my cast iron pan for that. Flipping my little tofu briquettes in my perfectly seasoned cast iron pan went smoothly. No sticking. Just a nice sizzle. Then I put them into the Mango Curry. Recipe from Thug Kitchen. THE. BEST. EVER. COOKBOOK (Thug Kitchen Cookbook). The finished product smelled divine! It passed the initial taste test too. But honestly, I did not eat a piece of the tofu just yet. Mostly because I thought the tofu would taste better if it had a chance to soak overnight in the curry sauce. So back to diving in to my lunch. Did I finally achieve a tofu triumph? Was I on my way to winning the war? How exactly did the tofu taste? 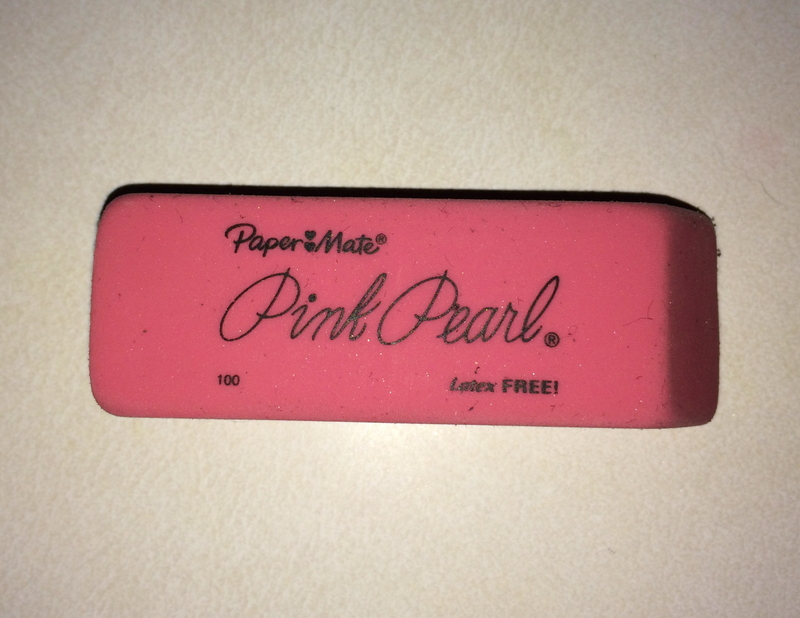 Yeah, well, you know those pink school erasers? Just in case you forgot what one looks like. Now you know what one tastes like. Any tofu cooking tips are more than welcome in the comments below. Umm, yeah. Your eyes do not deceive you. It’s a picture of a pair of slugs hanging out on a leaf . . . inside a pickle jar that my daughter made into a terrarium. I haven’t observed any slug lovin’ (not sure I’d recognize gastropod mollusk mating if I saw it), but they sure do like to spend time together. If one climbs up the side of the jar, the other soon joins him (her, it). When one chows on one side of a leaf, the other can be seen chowing on the other side. Maybe I’m anthropomorphizing these poor slugs. I like to write about friendship, especially when it’s found in unusual places or between unusual participants. I like to read about friendship too. One of my absolute favorite books I read this year was The Scorpio Races by Maggie Stiefvater which shows the intense friendship between a boy and his man-eating horse (I know there’s more to the book, but that’s my favorite part). So maybe I’m projecting what I want to see. My family and I return to our annual argument around this time of year: what are the best monsters of all time. Today, in the spirit of the season, I present my case for Zombies. Lets see if you agree with me. When your mother/partner/child turns on you like a rabid dog and starts to eat you, that is scary. When the people you are emotionally and physically closest to, who you have shared your life with, protected, loved, and helped raise, think nothing of ripping open your abdomen and eating your entrails, that is scary. When threats, pleading and/or squealing for your life is futile against your loved ones, who are hell-bent on EATING you, that is SCARY. #9. Cannibalism is DISGUSTING and morbidly fascinating at the same time. Did you read Alive by Piers Paul Read or any of the numerous books about the Donner party? I rest my case. #8. Zombies are UGLY. Maybe not at first, but give them a couple days in the hot sun and well, dead flesh will rot and it is not pretty when it does. Add on festering wounds and untreated injuries, and it’s hard to find residual human cuteness. Maybe those laugh crinkles around the eyes? That shiny white smile? Nope. #7. Zombies travel in PACKS. You can not fool yourself into thinking, oh, there is only one or two, I can take them down. ‘Cause, there is always more around the corner, and more, and more. #6. Zombies MOAN, but even worse, when they eat you they make those CHEWING and SWALLOWING noises while you are still alive enough to hear it. Now admit it, that is some major stomach rolling grossness you hadn’t thought of before. #5. Zombies have a FIRM GRIP. They are just hard to shake off. Once one gets hold of you, he is not letting go. Separate his hand from his body with a machete and that hand, with those vise-like fingers, is still wrapped around your ankle trying to take you down. #4. Speaking of down, Zombies DONT STAY DOWN. Shoot em, club em, hack away at em and they just keep getting up with that single-minded purpose of chowing on your flesh. Yeah, I know you have read and seen the movies, and you know if you shoot one in the head, then he is down for the count, but here is a thought: he was dead before you shot him in the head, and now, afterward, he is supposed to be REALLY dead? Just saying. #3. Zombies DONT SLEEP. Sorry, but this is a major advantage. You have to sleep some time. You do not need to sleep well, but you have this living cell thing going on which requires at least some sleep on a semi-regular basis. It bears repeating, Zombies don’t need to sleep and you do. #2. Zombieism (spelling?) is CATCHING. Transmittable, contagious, infectious, however you want to say it, but it is easy to become a zombie: one little bite. SMART PEOPLE SURVIVE. You betcha! Ultimately, its a waiting game in the war between humans and zombies. Time, the environment, and a million bacteria are on our side in a few months, a year at most, those zombies will do what every corpse on earth eventually does: DECOMPOSE. All you have to do is stay alive until then. Good luck to you all. 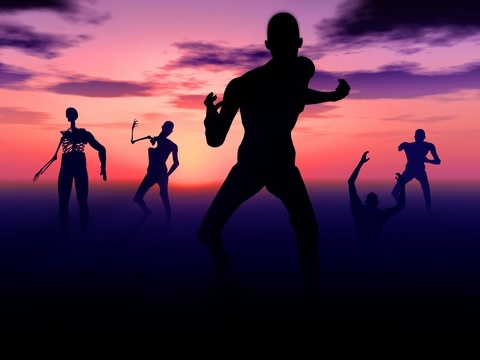 Next time we can address which Zombies are scarier, your traditional slow-moving, foot-dragging, dazed zombies or the ones who can sprint.